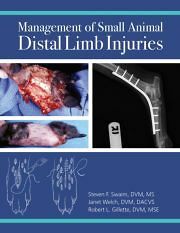 Small Animal Distal Limb Injuries provide the small and mixed animal practitioner with a definitive but practical, step-by-step guide to the management of soft tissue, orthopedic and athletic injuries of the distal limbs in dogs and cats. Includes specific coverage of injuries that occur from the carpal/tarsal areas to the digits of dogs and cats. All wounds and injuries are covered and all commonly performed management and bandaging techniques are presented as step-by-step black and white line drawings supplemented by before and after photographs. Regional anatomy is presented for orientation. The work is intended to consolidate, in a single volume, all of the applied clinical information needed for the effective management of distal limb injuries and their reconstruction. This book contains medical and surgical guide lines which are not currently available in the veterinary literature. It spans four important areas of small animal practice (wound healing, bandaging, orthopedic trauma and injuries to muscles, ligaments and tendons) which are of general interest to every practitioner. It contains up to date information regarding applicable drugs and is heavily illustrated. All three authors are very well known to the veterinary community and active on the meeting circuit. Of great use to undergraduate veterinary students in the latter years of study and to postgraduate students, as well as all small animal and mixed animal practitioners, trainers and others involved with athletic or working dogs.